I love Moths, the fuzzier the better. I have always wanted to catch a giant one in real life but nothing so far. I might as well illustrate my favorite Goth Moths! When painting these wonderful creatures, I imagined them flying through homes taking little breaks on walls in different historical times. Just sitting there long enough to get noticed. I created a small series (which I will be adding to) of beautiful illustrated moths for the June group show at City Art Gallery in San Francisco. Now, I am happy to announce you can buy the prints here in my shop! 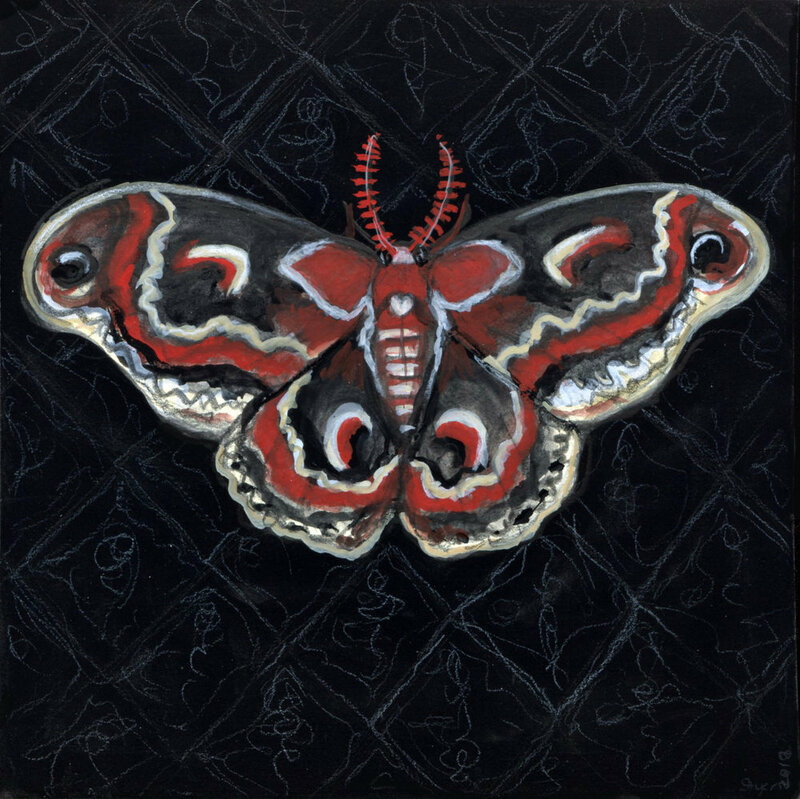 Cecropia Noir print available here. My Second moth is the Luna Moth (or Actias luna). I think the Luna Moth is the most glamorous of all moths with it lovely green wings. Although, pretty their lives are kind of sad. After emerging from their cocoons, the only live about one week and only to mate. They are also born without mouths. What a strange little beast. Here I have him settled in on lovely art deco wallpaper in the 1920's. Deco Luna art print available here. Lastly, is the creepiest of all moths the Deaths Head Hawkmoth (Acherontia )! I love the little skull design on his back. Besides the amazing gothness of these moth, they are rather strange creature. They actually emit a loud chirp when irritated. I wonder what that would sound like? I imagine this guy visiting a sweet family home in the 19th Century. A Victorian Deaths Head Art print available here. 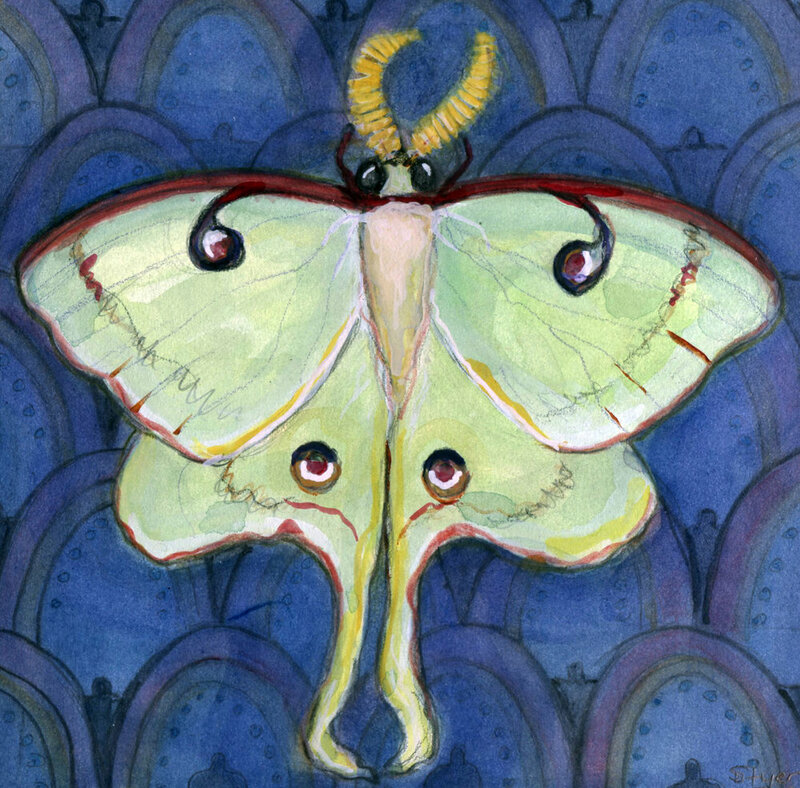 Do you have a favorite moth you would like me to paint next? Write it in the comments.